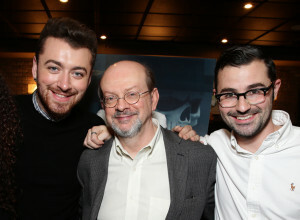 The winners are in, and they’re Ennio Morricone (for his Hateful Eight score) and Sam Smith and Jimmy Napes (for their Spectre song, “Writing’s on the Wall”). It’s only the second time in Oscar history that a 007 song has won Oscar gold (the last, of course, was “Skyfall,” from the previous Bond film) and their victory must be deemed a surprise. I chronicle the entire weekend’s music events here — including the musical ups and downs of the broadcast, Saturday’s SCL Oscar music reception, and Friday’s Hollywood Walk of Fame honors. 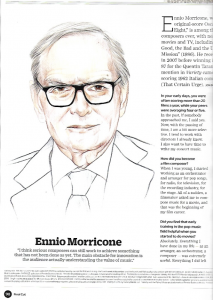 Anticipating Morricone’s Oscar win, I wrote a second story for Variety about the Italian maestro that enabled me to use more of our February interview. 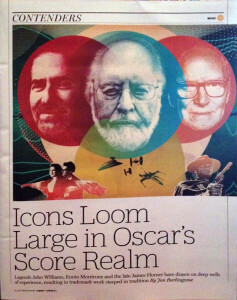 This entry was posted in Composers, Film Music, Interviews and tagged Ennio Morricone, Hateful Eight, Jimmy Napes, Oscar music, Sam Smith, Society of Composers & Lyricists, Spectre, Variety on March 2, 2016 by Jon Burlingame. The new James Bond film Spectre is out, and I was privileged to interview Grammy-winning singer-songwriter Sam Smith and his writing partner Jimmy Napes Wednesday night after a Society of Composers & Lyricists screening at The Grove. The guys were informative and entertaining, using terms like “expensive chords” that the composer/songwriter crowd loved. The song, which plays well with the lavish and beautiful title sequence — and can be best appreciated once you’ve seen the film and understand its context — has already hit no. 1 in the UK, the first Bond theme in history to do so. This entry was posted in and tagged Bond music, James Bond, Jimmy Napes, Sam Smith, Society of Composers & Lyricists, Spectre on November 5, 2015 by Jon Burlingame.